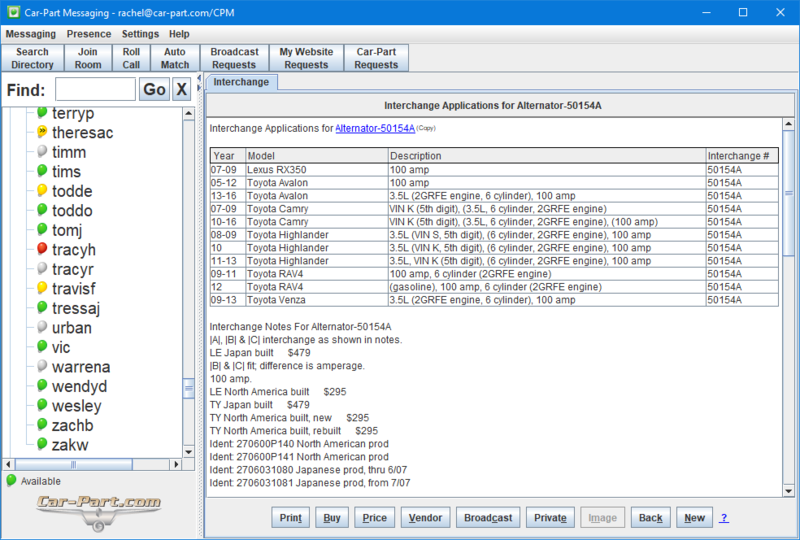 Instant messaging designed for the automotive recycler - with Live Chat and built-in interchange! 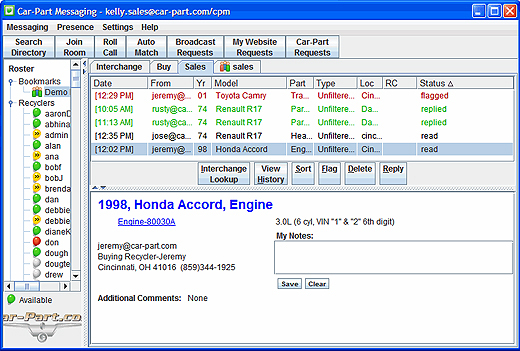 iCPM's Roster gives you easy access to your contacts so you can instantly communicate with other recyclers on iCPM, and with collision repairers using Integrated Car Part Pro (iPro). A search bar and a saved contacts group help you locate contacts quickly. Preset message buttons allow you to quickly send certain messages so you don't have to re-type the phrase every time. The preset message buttons can save any text you want, such as "Hi! How can I help you?" or "Our standard warranty is 30 days." The Live Chat feature allows your customers to contact you right from their search results, and have an instant messaging conversation with you. 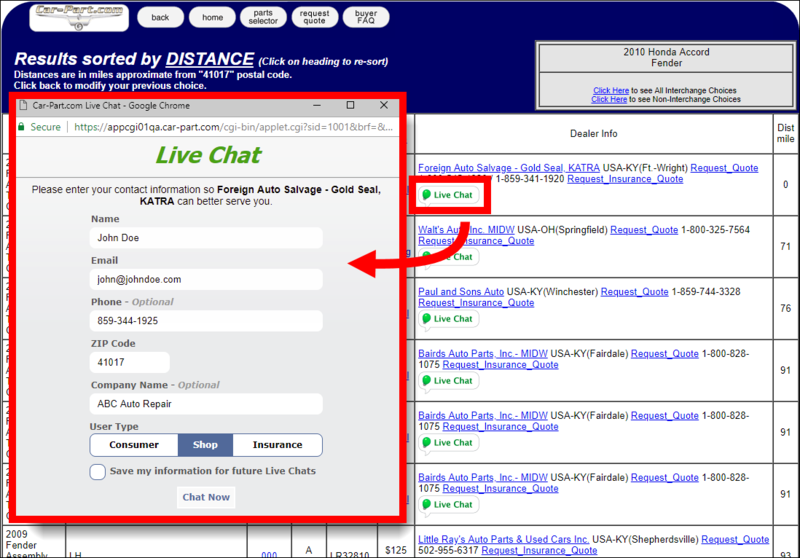 On Car-Part.com, the Live Chat works for your customer in their browser. On your side, you get these messages in iCPM so you can answer any questions or arrange a sale. The message includes the customer's search information, so you know from the start of the conversation what your customer is looking for. 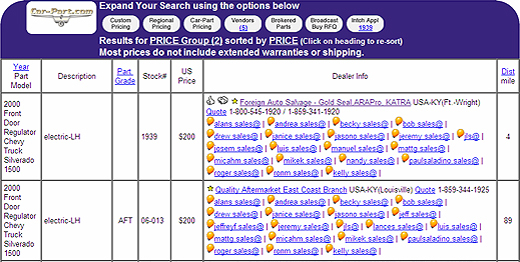 You can view part requests from other recyclers in the Sales tab. The Sales tab works like an email inbox-you can view requests, keep track of which requests are unread, and quickly reply to the other recycler to easily make a sale. You can also review any conversations you have had about this part, and flag any requests that you want to remember to review later. From the Sales tab, you can reply to requests with a private conversation. While it is easiest to review and reply to part requests through the Sales tab, you do have the option of viewing these same requests in the traditional sales room. Plus, the Auto Match and Broadcast Requests buttons on the toolbar let you quickly view requests other recyclers have posted on the Bulletin Board. 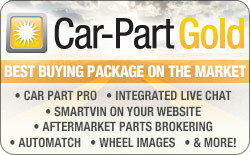 If you list your parts on Car Part Pro, you can opt to provide Real Time Part Verification. 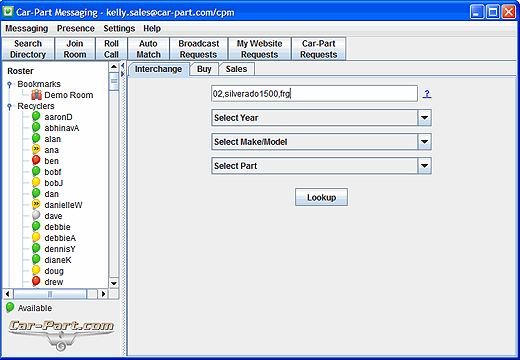 This includes a Confirm Availability button on all of your part listings on Car Part Pro, and it allows Car Part Pro users (like body shops and insurance adjusters) to confirm the part's availability in real time. 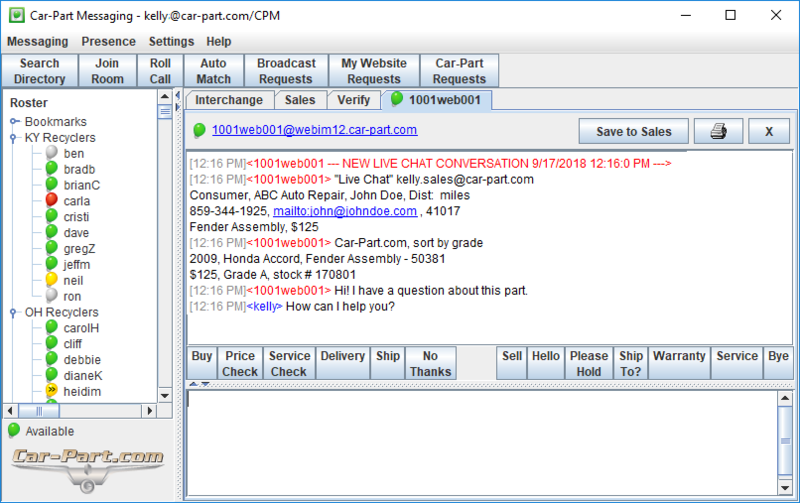 When a customer clicks Confirm Availability on one of your parts, your Verify tab on iCPM provides you with an immediate notification. This notification will include details such as the part information, user type, contact information, price breakdown, and the message they received from the service. As you can see, each notification contains valuable sales leads! Whether you're looking for a part to buy or just want to price a part you already have, begin right on the Interchange tab. Enter the year, model, and part, and then click Lookup. Price this part or search vendors' inventory by launching a Trading Partners search from within iCPM. If you're looking for a part, you can also choose to Broadcast this request. This will send the part request to a sales room (group of recyclers) and the Bulletin Board. Any part requests you send will also automatically be saved to your Buy tab, so you can easily review the requests you have made and any replies you have received. 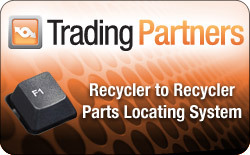 Send a private request for this part to a contact or a group of recyclers. Don't want to broadcast a part request? Quickly send a private request for quote to a single contact, or a particular group of recyclers on your Roster.